VANCOUVER, BRITISH COLUMBIA, June 07, 2018 -- Lupaka Gold Corp. ("Lupaka Gold" or the “Company") (TSX-V: LPK, FRA: LQP) is pleased to announce the results from a recent systematic underground sampling program on the newly developed 3430 production sublevel, located 30 metres up-dip of the 3400 Level, at the Company’s 100% owned Invicta Gold Development Project (“Invicta Project” or “Invicta”). * Au-Eq. calculations are based on US$1250 for gold ("Au"), US$17.00 for silver ("Ag"), US$3.00 for copper ("Cu"), US$1.25 for zinc ("Zn"), and US$1.05 for lead ("Pb"), with assumed mill recoveries of 85% for Au, 80% for Ag, 82 % for Cu and Pb, and 77% for Zn. Development on the newly constructed 3430 sublevel was initiated in preparation for the first block of mining production (located between the 3400 Level and the 3430 sublevel), scheduled to commence in the third quarter of 2018 (“Q3 2018”). 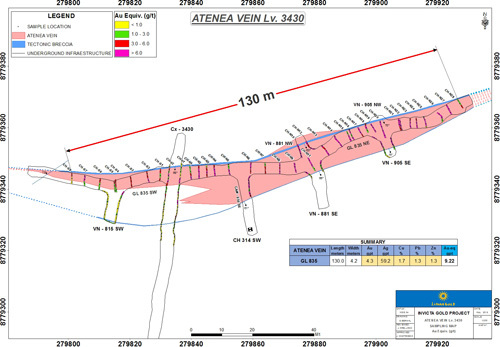 Subsequent to cross-cutting the Atenea vein, lateral development preceded southeast and southwest over approximately 235 m, including the creation of four additional cross-cuts (see plan in Appendix A), ending in mineralization on the eastern face. 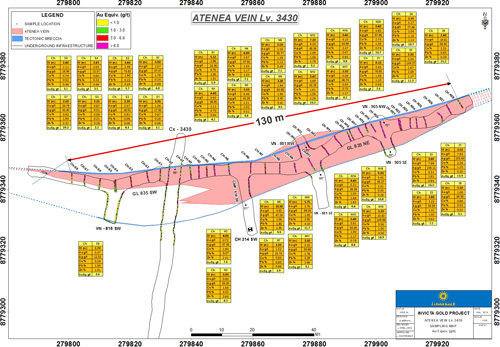 The 3430 sublevel development also provided an opportunity to demonstrate the vertical and horizontal continuity of the Atenea vein and to compare the sampled grades with the current Mineral Resource block model, as well as the mineralization contained on the 3400 Level, located 30 metres below. Consistent with the comprehensive sampling program undertaken on the 3400 Level (see plan shown in Appendix B), underground channel sampling was systematically performed on the 3430 sublevel over the width of the development (3.5 m wide by 3.0 metres wide) at intervals of approximately every 5 m (consistent with the size of the Mineral Resource block model), as well as over the five cross-cuts. The polymetallic mineralization within the Atenea vein is hosted by structurally defined components which were mapped and sampled. Summarized assay sample results are tabulated and presented in Table 1, and a detailed sampling map is provided in Appendix A. Overall, the sample results were found to be consistent with sample results from the 3400 Level located 30 m below, however, the average sampled grade of 9.22 g/t Au-Eq. is higher than the estimated grade of 8.12 g/t Au-Eq. contained within the Mineral Resource block model from the sampled area. Importantly, the geological mapping on the 3430 sublevel showed that the hanging wall split vein, as seen on the 3400 Level, has merged with the footwall zone. The continuation of the hanging wall split and the footwall zone through the 3430 sublevel was assumed in the Mineral Resource model and in the PEA conceptual mine plan. The merger of these zones could potentially result in more efficient mining and lower dilution upon extraction of the mineralized material (due to the absence of non-mineralized material in between the two zones). 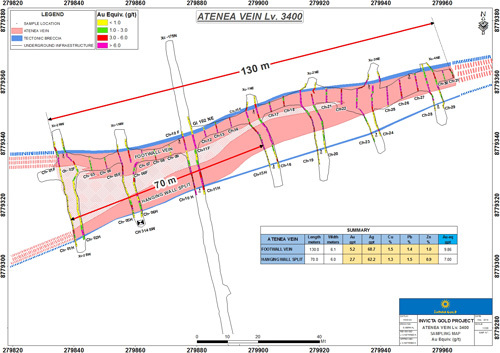 Although the average sampled width of the Atenea vein on the 3430 sublevel was 4.2 m, compared to approximately 6.0 m on the 3400 Level, sampling on the 3430 sublevel was restricted by smaller development headings (3.5 m wide), as well as fewer cross-cuts (5) compared with the 3400 Level (7). 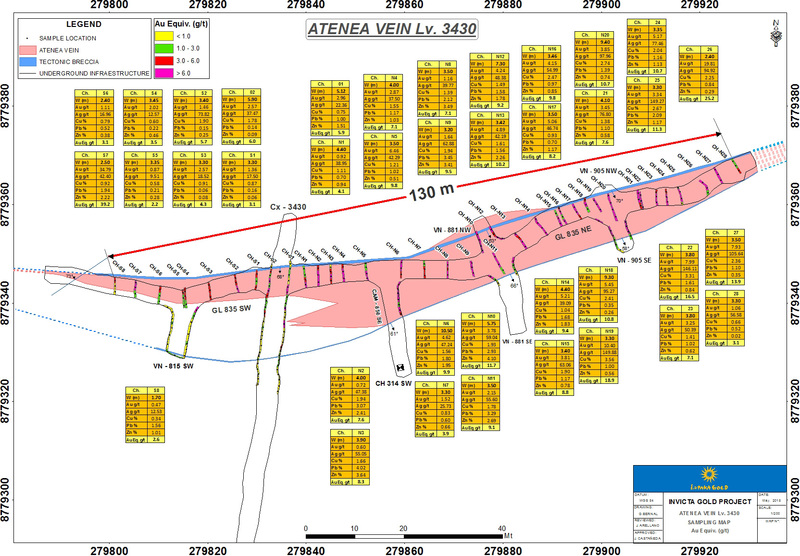 Geological mapping and sampling over the 5 cross-cuts on the 3430 sublevel demonstrates an estimated horizontal width of the Atenea vein ranging from 4 m up to 12 m. It is anticipated that the average horizontal width on 3430 sublevel will be in-line, or possibly exceed, the average conceptual mining width of 8.0 m, as estimated in the PEA conceptual mine plan. Summary results obtained from 205 samples taken in the drift and crosscuts, over spacing of approximately every 5 m, are tabulated in Table 2. Mineral Resource Statement of 3.0 million tonnes of Indicated Mineral Resources at 5.78 g/t Au-Eq. using a 3.0 g/t Au-Eq. cut-off, and 0.6 million tonnes of Inferred Mineral Resources at 5.29 g/t Au-Eq. 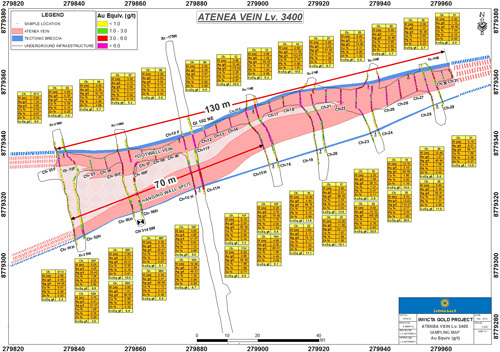 Further information about the PEA and the resource estimate referenced in this news release, including data verification, key assumptions, parameters, risks and other factors, are provided in the technical report prepared following Canadian Securities Administrators’ National Instrument (NI) 43-101 and Form 43-101F1 guidelines for the Invicta Project dated May 11, 2018, and is available under the Company profile on SEDAR (www.sedar.com). Invicta Gold Development Project - 100% owned, the Company’s flagship project is an advanced stage gold-copper polymetallic underground deposit located approximately 120 kilometres north of Lima. Over $12 million of capital has been spent by previous owners on development and infrastructure at Invicta, and management expects to commence potential production in the second half of 2018 by using third-party mining contractors and utilizing the existing adit and workings. The Invicta project is fully permitted and community agreements are in place. Invicta’s approved EIA allows for mine production of up to 1,000 tpd, although the current conceptual mining plan is targeting 350 tpd. The PEA is preliminary in nature and includes Inferred Mineral Resources that are considered too speculative geologically to have the economic considerations applied to them that would enable them to be categorized as mineral reserves and there is no certainty that the PEA will be realized. Mineral resources that are not mineral reserves do not have demonstrated economic viability. The estimate of mineral resources may be materially affected by environmental, permitting, legal, title, taxation, socio-political, marketing, or other relevant issues. The quantity and grade of reported inferred resources referred to in the PEA are uncertain in nature and there has been insufficient exploration to define these inferred resources as an indicated or measured mineral resource category. It is important to note while a mine production decision has been made by the Company, that the information provided in this news release is preliminary in nature. There is no certainty that a potential mine will be realized. A mine production decision that is not based on a feasibility study demonstrating economic and technical viability does not provide adequate disclosure of the increased uncertainty and specific economic and technical risks of failure associated with such a production decision. The technical information in this document has been reviewed and approved by Julio Castañeda Mondragón - MAIG, the President of Lupaka Gold Peru S.A.C., a Peruvian subsidiary of the Company, and a Qualified Person as defined by National Instrument 43-101. Mr. Castañeda has verified the scientific and technical information, including sampling, analytical and test data underlying the information or opinions contained in this news release. This press release contains forward-looking statements which constitute "forward-looking information" within the meaning of applicable securities laws, including all statements, trend analysis and other information relative to anticipated future events or results. All statements, other than statements of historical fact, included herein are considered forward-looking statements, including, without limitation, statements relating to: any benefit to development costs and improvement in mine dilution from the merger of the hanging wall split and the footwall zone; the commencement of potential production from the Invicta Project in Q3 2018, the targeted mining rate of 350 tpd, anticipated methods of production and the generation of cash therefrom. Forward-looking statements are based on assumptions, estimates and opinions of management at the date the statements are made and which the Company believes are reasonable. Such information involves risks and uncertainties, and undue reliance should not be placed on such information, as unknown or unpredictable factors could have material adverse effects on future results, performance or achievements of the Company. Among the key factors that could cause actual results to differ materially from those projected in the forward-looking information are the following: that the repayment of the PLI Financing is consummated on the anticipated terms; that the Company will not experience any material accident, labour dispute, shortage of skilled and professional staff, changes in project plans, equipment availability and failures, process failures, the ability of third party service providers to deliver services on reasonable terms and in a timely manner; future exploration activities planned at the Invicta Gold Project, and the timing and results thereof; market conditions and general business, economic, competitive, political and social conditions and with respect to the planned mining operations at Invicta; that pre-production mine development can be completed in the time and for the cost projected; that the Company will be able to obtain funding for planned production expenses; that mineralization at Invicta will be of the grades and in the locations expected; that the Company will be able to extract and transport mineralized rock efficiently and sell the mineralized rock at the prices and in the manner recoveries and quantities expected; that permits will be received on the terms and timeline expected and that other regulatory or permitting issues will not arise; that mining methods and reclamation can be employed in the manner and at the costs expected and that such methods yield the results the Company expects them to. Forward-looking information involves known and unknown risks, uncertainties and other factors which may cause the actual results, performance or achievements of the Company to be materially different from any future results, performance or achievements expressed or implied by the forward-looking information. Such risks, uncertainties and other factors include, among others: all of the risks described in this news release; that the Company will not be able to comply with the delivery or other obligations in the PLI Financing Agreement and the risk that PLI will enforce its security over the Company’s assets, including its mineral properties; changes in commodity prices; currency exchange rates (such as the Canadian dollar versus the United States dollar); risks associated with dilution; labour and employment matters; risks in the event of a potential conflict of interest; changes in general economic, business and political conditions, including changes in the financial markets; changes in applicable laws; and compliance with extensive government regulation; and other risks generally associated with mineral exploration. This forward-looking information may be affected by risks and uncertainties in the regular course of business and due to market conditions. Additional risks are described in the Company’s annual information form, which is available on SEDAR at www.sedar.com.